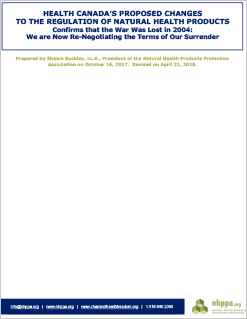 THE NATURAL HEALTH PRODUCT INDUSTRY IS AT RISK. 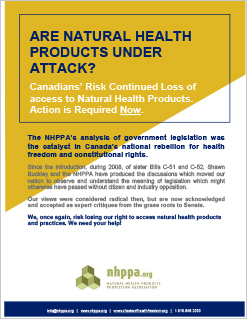 Use these handouts to educate your staff, customers and clients about the crisis facing the natural health product industry which threatens their future access to the products and treatments they’ve come to rely on. 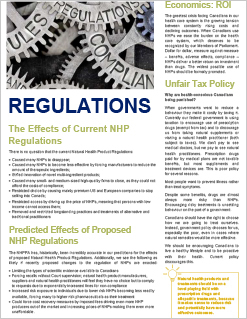 Whether using these handouts as bag stuffers, displaying them in a prominent location, or offering them for takeaway, we’re confident these resources will help your staff, customers and clients understand the consequences of inaction and allowing Health Canada’s proposed new regulations to become reality. 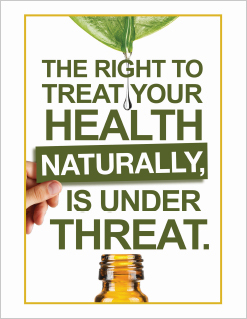 Are Natural Health Products Under Attack? 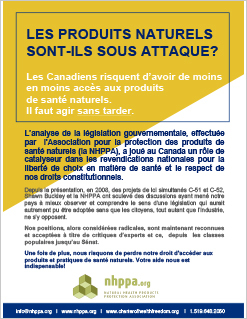 Les Produits Naturels Sont-Ils Sous Attaque? 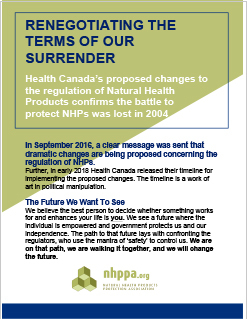 “NHPPA fought to have the NHP Regulations repealed for over a decade. 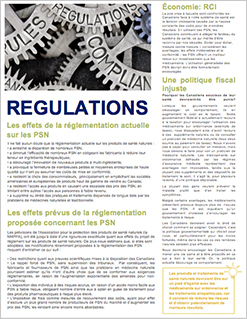 Why are we now “surrendering” to the existing regulations?” An outline of the most salient points from Shawn Buckley’s discussion paper. 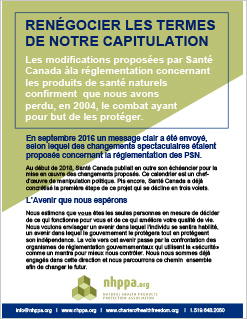 Les modifications proposées par Santé Canada à la réglementation concernant les produits de santé naturels confirment que nous avons perdu, en 2004, le combat ayant pour but de les protéger. 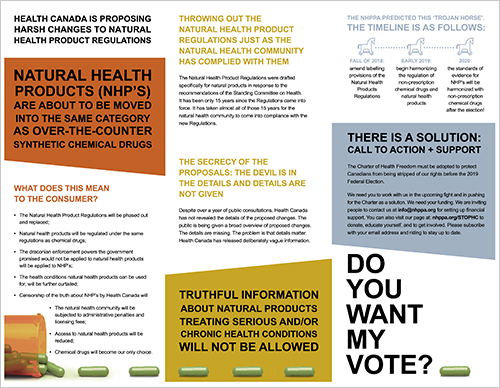 “The Charter of Health Freedom can protect your access to Natural Health Products & Practices.” This piece of proposed legislation that gives natural health products and practices their own Act and creates a separate Ministry of Wellness, whose purpose is to protect and promote access to natural treatment options. This document outlines the value of supporting the Charter. 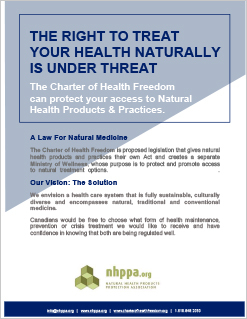 At the time of printing the Charter of Health Freedom was at 96,497 signatures. In this document we review why it’s important to support the Charter petition, and the reasons we have not launched an electronic petition drive. 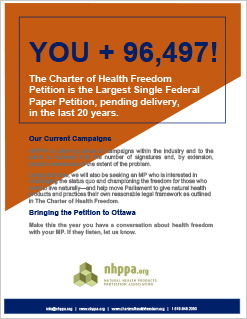 The Charter of Health Freedom Petition is the Largest Single Federal Paper Petition, pending delivery, in the last 20 years. Includes: Why Is This Petition Important? 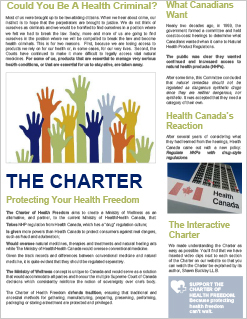 Why Should Every Canadian Sign The Charter of Health Freedom Petition? 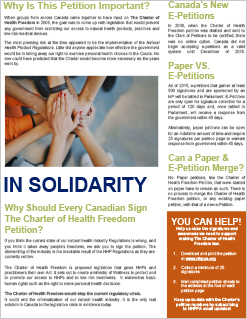 Canada’s New E-Petitions Paper vs. E-Petitions Can a Paper & E-Petition Merge? 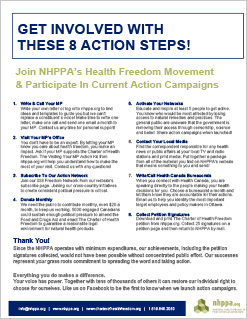 Join NHPPA’s health freedom movement and participate in current action campaigns. 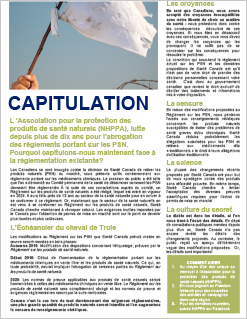 In this handout, we’ve outline 8 simple steps to amplifying your voice as a Canadian citizen! 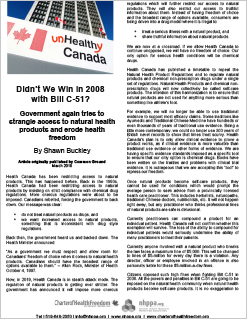 In this March 2019 article originally published by Common Ground, Shawn Buckley discusses how government is again trying to strangle access to natural health products and erode health freedom. We re-shared this article written by Shawn Buckley for Vitality magazine in December 2016 because he discusses how our Freedom of Choice in Health Care Faces an Uncertain Future. This is more true now than ever. Magic Pills of Magic Journalism? In this article, written by Shawn Buckley in December 2015, he discusses biases apparent in today’s journalism. 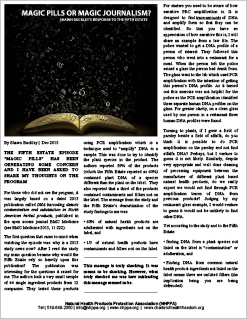 He offers critical analysis about the DNA barcoding detection of contamination and fillers in natural health products. The question this article answers is: If we cannot harm people without legal consequences, why are Health Canada employees allowed to? Shawn Buckley offers a brief analysis of the Charter’s renewed relevance in 2018. 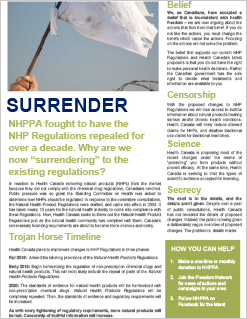 “Confirms that the War Was Lost in 2004: We are Now Re-Negotiating the Terms of Our Surrender.” Shawn Buckley offers his expert analysis of proposed changes to NHP Regulations in Canada. This is a must-read document for anyone who believes in freedom of choice.